Apart from the tiny water flea, daphnia, the number one item on the Stillwater trout’s menu is the chironomid midge or buzzer. During the first three months of the season this insect is consumed in vast numbers and, even when the water is still cold and surface activity virtually non-existent, a few feet down the trout will be feeding heavily on the larvae and pupae. When the trout are taking buzzer pupae close to the lake bed the key to success is to present a good imitation as deeply as possible. By combining a heavyweight hook and a slim, quick-sinking body the Varnished Buzzer gets to the feeding zone fast. In its earlyseason form this pattern is best tied with a black body on a size 10-12 hook to mimic the size of the naturals while later in the year, as the lighter buzzer species appear, olive and red work extremely well, too. This pattern is usually tied without the breathing filaments at both head and tail. However, the orangey-brown wing buds, which make a key recognition point in buzzer imitations, are suggested with strands of orange Flexi Floss. 1. Fix the hook in the vice and run on tying thread just behind the eye. Catch in two strands of black Flexi Floss. 2. Take a third strand of Flexi Floss in a contrasting colour. This can be any lighter colour – here it is white. Catch it in at the same point as the black strands. 3. Secure the Flexi Floss with tight thread wraps then begin winding close turns of thread down the hook, stretching the Flexi Floss at the same time to reduce bulk. 4. 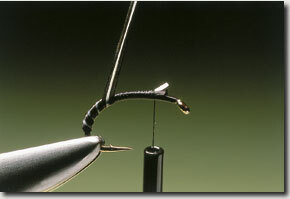 Carry the thread over the floss until it is well round the hook bend. This will form the curved body of the Buzzer. 5. Run the thread back up to the catching-in point. Take hold of all three strands of floss. Stretch the floss slightly then begin to wind it along the hook. 6. The strands should lie flat to create a slim body. The white strand suggests segmentation. Secure the loose ends and remove. Catch in a length of pearl tinsel at the front of the body. 7. Take a short strand of orange Flexi Floss. Fold it in half and catch it in by its ends just in front of the body. 8. Repeat the process, catching the second strand in on the other side of the hook. These will suggest the pupa’s wing buds. 9. Catch in a short strand of black Flexi Floss immediately in front of the pearl tinsel. Wind it over up to the eye to form the thorax. 10. Take hold of the closest strands of orange floss and stretch them forward until they reach the eye. Maintaining tension, secure the ends with tying thread. 11. Do the same with the strands on the far side of the hook then pull the pearl tinsel over the top of the thorax. Secure that, too, at the eye. 12. Add extra turns of thread to ensure all the materials at the eye are fixed firmly in place then remove the excess. 13. Build a small head and cast off the thread with a whip finish. Finally, add a couple of coats of clear varnish or epoxy and leave to dry. When trout are feeding hard on buzzer pupae close to the lake bottom it is crucial that the imitation gets right into this feeding zone. Too high in the water and it simply will not be seen. This pattern, which is tied slim and heavy, sinks very quickly so that it is in the feeding zone for as long as possible. From later April through to June trout will take buzzer pupae in prodigious numbers. It is during this period that this pattern works best, before the fish begin feeding higher in the water column. Although it will work when fished on an intermediate line, the most effective way is to fish this pattern very slowly on a floating line and a very long leader. This leader can be as long as 20 feet, or more, depending on the depth of water. The Varnished Buzzer is normally fished on the point with lighter patterns on the droppers. When tying with Flexi Floss, or a similar product, always wind it under reasonable tension. This will help form a slim body or a tight rib.